Increases horsepower by reducing accessory drag and eliminates belt throwing. 12.5 HP at rear wheels. These pulleys have been designed for normal street driving. March Ford Pulleys increase horsepower by reducing accessory drag. 11 HP at rear wheels. Perfect for vehicles with automatic transmission or high-amperage need. Designed to give superb performance while maintaining perfect electrical charging, even at idle. They are excellent for harsh stop-and-go driving. March Ford Pulleys increase cooling by speeding up water flow and fan speed. This is crucial during critical low-speed driving when most overheating occurs. High Water Flow Ratios pulleys are just what you need to prevent overheating. Steel Sets are precision machined to run perfectly true. High-carbon billet steel covered with iron phosphate and then powdercoated high-gloss black polyester for maximum rust prevention. Aluminum Sets are machined from 6061-T6 billet aluminum for extra strength and wear. 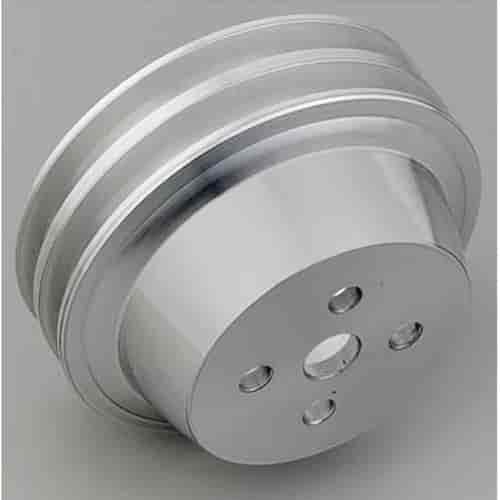 Pulleys are also hard coated on all high wear surfaces to increase pulley life. Finished with a "No Polishing" clear powdercoat.